Prepare to meet your new favorite chocolate and peanut butter treat. This one is a runaway best-seller for good reason – they are insanely delicious! 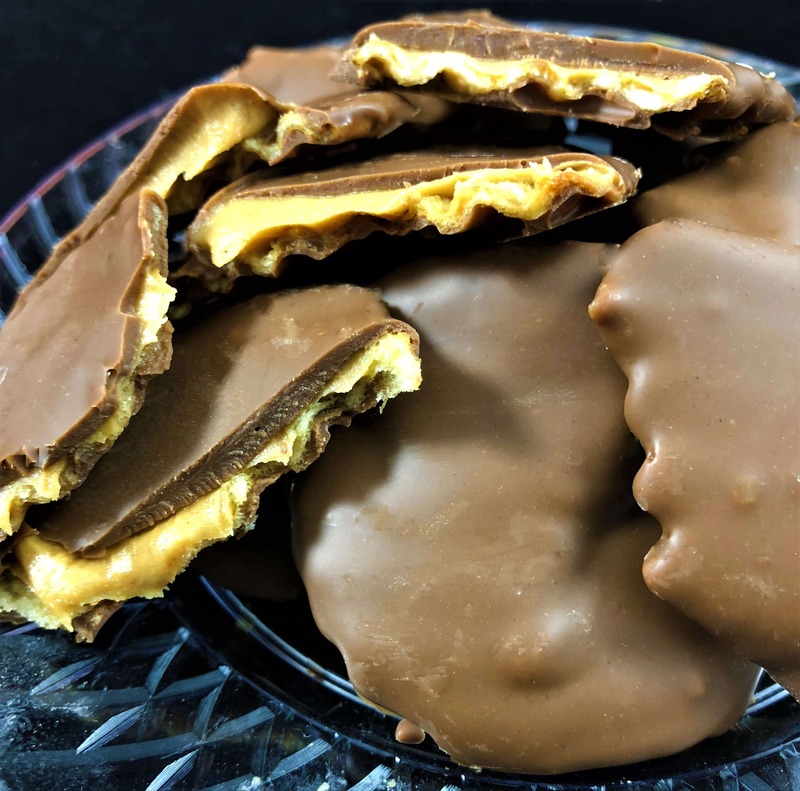 Milk chocolate Peanut Butter Wings are crisp, rippled potato chips with creamy peanut butter spread generously on every chip and then drenched in rich milk chocolate. Yes, we went there! We created a salty-sweet combination that will leave your taste buds shouting for more. You get crunch from the chip, salty goodness from the peanut butter and melt-in-your-mouth sweetness from the gourmet chocolate. 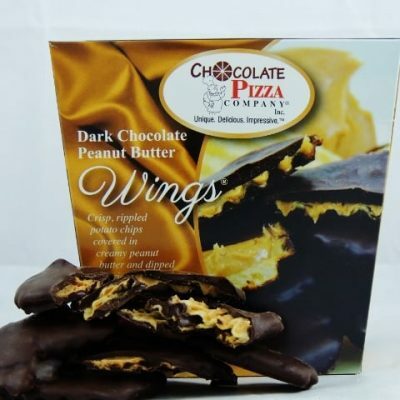 Milk chocolate Peanut Butter Wings are our most popular single gourmet chocolate specialty item for a reason – they are the best chocolate and peanut butter treat you will ever bite into. 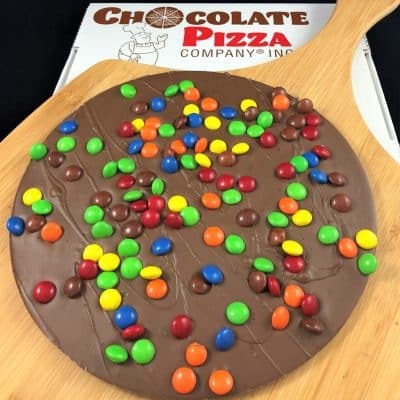 Try one and you’ll never look the same at chocolate and peanut butter again. We’ve taken that perfect flavor pairing to new heights so sit back and enjoy the ride. 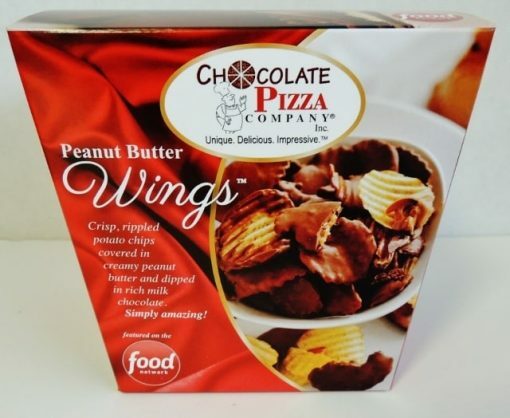 Food Network was impressed enough to feature Milk chocolate Peanut Butter Wings on episodes of both “Unwrapped” and “Food Factory.” They were an “Editor’s Choice” in Fancy Foods and Culinary Products blog and have been covered by media sources nationwide. So distinctive and unique are they that they earned a federally registered trademark. But all you’ll notice is that you can’t eat just one! Chocolate Pizza Company makes Peanut Butter Wings by hand – over a quarter million of them a year. Yep, our chocolatiers pick up every chip and spread peanut butter generously across its ridges and valleys before placing it on a conveyor for its trip through a chocolate curtain and down a long cooling tunnel. They are packed in two sizes, 8 ounces or 16 ounces, and come in milk or dark chocolate. 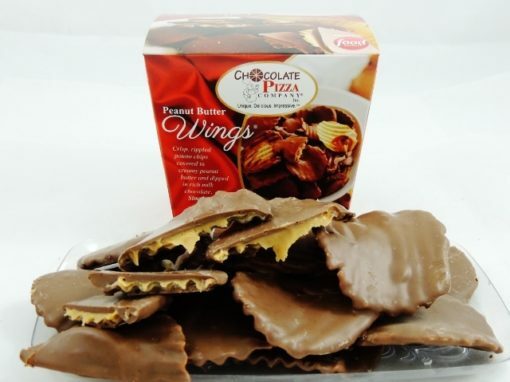 We invented Peanut Butter Wings to go with our signature Chocolate Pizzas. 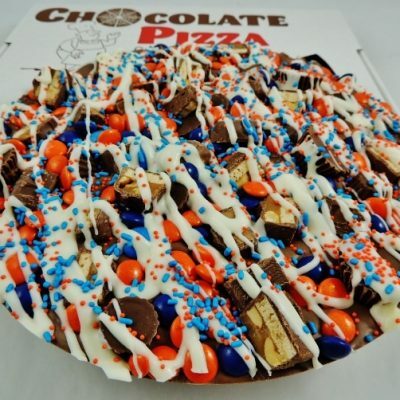 After all, there is nothing more American than “Pizza and Wings.” But whether you buy them to go with you Chocolate Pizza or to just enjoy by themselves, every bite delivers the kind of “wow” factor that makes this a memorable choice.